It's not often that people really get to see the inter-workings of a band. It's like being around a family. Hang around them enough and you'll see the glamour and the dirt. For a band, where those walls truly start to melt down is when you hit the road. Hailing from Salt Lake City, UT, writer and publicist RGB Robb embarks on a unique experience to go on tour (which he'll go into more thoroughly in his upcoming book.) Armed with his laptop and train ticket (so classy) he made his way over to Seattle to join The Adarna for their Jet City Rock tour. Enjoy! I’ll never forget hearing those words out of the mouth of The Adarna vocalist/guitarist William Perry Moore. Though the statement itself could be interpreted with a certain level of arrogance, it was said with emotions that were quite the opposite: pride and relief. Since this was my first major tour, I have to admit that it didn’t begin in a way that bolstered a ton of confidence. 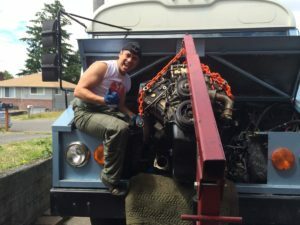 Originally, the tour bus, Wendy, was supposed to have a new engine installed and be completely ready to go by the first date of the tour on August 5th, 2016 at The Skylark in Seattle. It wasn’t. The next night of the tour at Ash Street Saloon in Portland, Oregon, and the three-hour drive which was supposed to be the road test for the bus, never happened—the trip was made using vans and one of the opening acts’ drum kits (causing issues on-stage when it fell apart after the second song of the set). After Moore, drummer Murdock, and bassist Oliver Spencer had been working on the bus for 12-hours a day for a week solid, it wasn’t until a few dates had been cancelled in the Midwest and the clock had run out to making the show in Bloomsburg, Pennsylvania before the realization that this North American tour was going to be done in a van and a trailer. After spending all morning securing the van and trailer, the above statement was the first words that came out of the mouth of Moore. He was right. 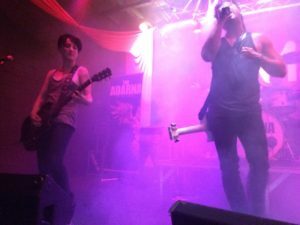 Having been around the music business for years, I had seen so many bands try and fail, to get the necessary items together in order to make a tour a reality. 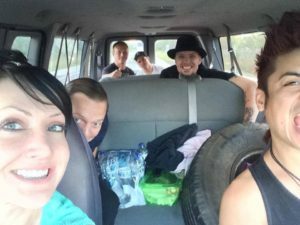 To see The Adarna pool their resources and be able to get a van, insurance on the van, a trailer, and every other item needed to make the trek a reality in one morning was truly impressive. By the end of the tour, I learned that this band and its members have been around the musical world enough times to know that it isn’t how badly things can happen—there are no limits to the amount of problems that can arise—but how to overcome them to ensure that their commitments are met. 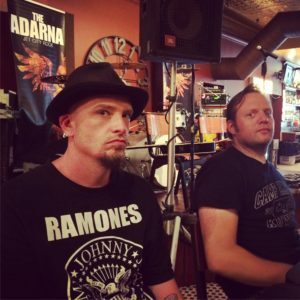 I recall how often guitarist Andreka Jasek would relate her concerns over making all of the shows due to the reputation the band had gotten for their professionalism … a reputation well-deserved. Having christened the new van “Denty”—after the number of dents, and it rhymed with Wendy—we were all on our way to Balzano’s. The drive from Seattle to Bloomsburg was 47 hours solid. The ONLY times we would stop was when we needed gas or the restroom. That’s it. The longest stop was 20 minutes, oftentimes we had to “hold it.” Though incredibly fatigued, we arrived at the venue just in time for load-in and soundcheck. Shortly thereafter, we had enough time to pound down a couple of slices of pizza, take a quick shower at the hotel, and get changed into stage gear with no time to spare. When they hit the stage, there wasn’t a hint of the travelling that had just transpired … the band gave it their all. Of course they would given the fact that not only were there family members in attendance, but also fans who had driven over an hour-and-a-half to see their favorite band. Most people would kill for a day to rest and get their bearings at this point, and The Adarna were no different, but the itinerary would not allow for it. After the Balzano’s show, they were scheduled to play four more shows in three days: House of Guitars (a special acoustic show) and Pineapple Jack’s in Rochester, New York, a house party in Syracuse, New York, and 33 Golden Street in New London, Connecticut. Though everyone was running on fumes, the only time that there were any visible—or in this case auditory—clues as to how the band was feeling, was in Moore’s voice at the New London show. Most of the songs were sung in a lower registry, and some had been cut due to the strain. But nobody at any of the shows had any complaints, and many who came up to me afterward spoke of how great their shows were. The following day was the first day off and was spent with friends in Kingston, New York. One thing that I learned was of utmost importance to The Adarna, and really would benefit any touring band, is that they have forged some incredibly strong friendships. In fact, it’s because of friends and family in the Pennsylvania/New York area that made this portion of the country a “must-stop.” These friendships can help out in more ways than just increased show attendance. Friends can help with a place to sleep, food, a shower, and a myriad of other living necessities. Sure, it’s fun to stay in a hotel and get free breakfast, TV, and other luxuries, but when you are a band who takes zero in the way of a salary—The Adarna puts all of their money made back into the band, one of the reasons they were able to afford the van and trailer in the first place—and has to monitor every penny going out as to make sure you have enough to get home if you automobile breaks down in Topeka or somewhere out of the way, having friends willing to put you up is extremely helpful. The next event that occurred which showed the band’s intense drive to allow their fans a full experience took place at the anime convention known as Saikoucon in Lake Harmony, Pennsylvania. Shortly after arriving, and before the first show of two (with a Q&A panel on the third day), one of the member’s had their significant other leave them (out of respect, they will remain anonymous). They handled it so well, I wasn’t even aware anything had happened until the final day. Also in that trip, Jasek was taking college courses and was required to take tests and have them submitted to her professors by specific times, and without any opportunities for re-taking them. Because the internet connection was so untrustworthy at the con, one of her tests failed transmission, thereby causing her to fail it. Yet she never complained, never felt robbed, and took it in stride. Though she was upset over it all, no one could tell. An important lesson that is so cliché, yet was exhibited at almost every turn: the show must go on. Not once at any point did the band “phone in” a performance. After Saikoucon, it was off to Denver, Colorado. 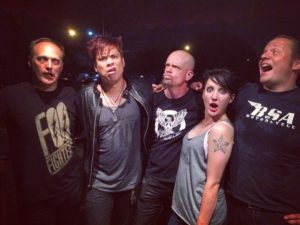 Knowing that Murphy’s Law was in effect, we left immediately after the con to ensure that not only would we arrive at Herman’s Hideaway in Denver on-time, but we would be there in the morning to allow for some sight-seeing since this was their first time playing that city. But again, there was another test before us. With leaving late from Lake Harmony, repairs were needed for Denty, there was a 12-hour layover in St. Louis, Missouri. Undeterred, the band carried on, though leaving St. Louis was done a lot later than anticipated. Of course, these road dogs knew what was on the line, and made it once again to the venue just in time to make load-in and soundcheck. The show was played incredibly well, and with the next show being a TV taping in Park City, Utah at noon the following day—which was also impacted by the 11 hour drive—as soon as the band was done, the van and trailer were loaded and started a straight drive-through on no sleep. Like the Denver show, we arrived in time for load-in, soundcheck, and then the taping commenced … all without a hitch. The show that night at The Metro Music Hall in Salt Lake City, Utah went well and the band was on their way to the final leg. Of course, there were a couple of other issues for the shows at Diamondz in Jerome, Idaho and The Roxy in Kennewick, Washington with the booking, but all of the remaining shows were played with heart and soul. After reflecting on everything that happened during the Jet City Rock tour of 2016, the one question I am most often asked is “why?” Why go through all of the headache without any pay? Why put yourself through such a physically rigorous lifestyle without a huge financial reward at the end? It’s easy to see why these questions would be asked—especially by those not overly familiar with the music business. The answer I give is that there are rewards for working this hard that may not be a paycheck. The biggest reward for The Adarna this time is the opportunity to play Rocklahoma. 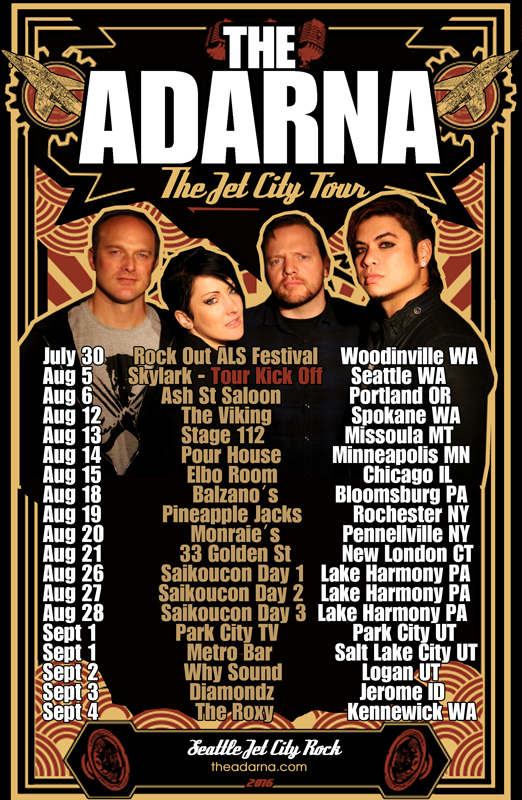 Yes, it’s because of this hard work and “never say die” attitude that The Adarna have been extended the opportunity to play at one of the largest hard rock festivals in the United States. A festival that will include Def Leppard, Soundgarden, The Cult, The Pretty Reckless, and The Offspring—along with many more. So, if there is one thing that I hope is taken away from this piece: though there may be a lot of adversity that comes your way in regards to your dreams and goals, if you work through them, then someone, somewhere will notice, and many doors that were once locked, will open with relative ease.